Legendary Pa Fortunatus Olatunji Gomez will be laid to rest today at the Ikoyi Cemetery Annex after a funeral service at the Cathedral Church of Christ, Marina. The service will hold at 11 am. Reception of guests is scheduled for 3 pm at City Hall, Lagos. A Service of Songs was held last Wednesday for the deceased at the Cathedral Church of Christ, Marina while a Wake Keep was held yesterday at Kings College, his beloved alma mater. Pa Gomez, as he is fondly called, died on July 17, 2018 after a brief illness. 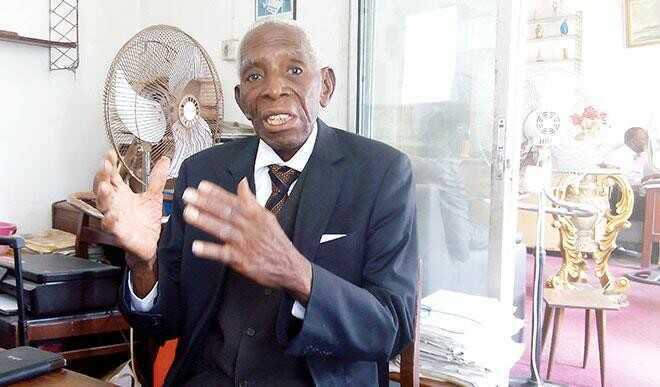 A veteran and consummate Bar-man, Pa Gomez was a regular feature at Nigerian Bar Association (NBA) Lagos Branch meetings even in the twilight of his life. Announcing his demise, Nigerian Bar Association (NBA) Lagos Branch Chairman, Mr. Chukwuka Ikwuazom said in a statement:“It is with a heavy heart that I announce the passing of Pa Tunji Gomez. Pa Gomez was until his death yesterday night, the oldest practicing lawyer in Nigeria and a deeply loved member of the Premier Bar. “The Branch had, in recognition of his excellent service and uncommon devotion to the Branch, celebrated his 90th birthday in style a few months ago. Popularly known by his sobriquet, “It’s a matter of conscience,” Pa Gomez was Nigeria’s oldest practising lawyer prior to his demise. He was considered as the Conscience of the Bar, always pointing the association towards a path of moral rectitude. He was also passionate about the plight especially of young lawyers. He was born in 1928 and enrolled into King’s College, Lagos in 1944. His activism manifested early in his eventful life, as he is reputed to have led the 1948 strike at the College which significantly turned around the fortunes of the students. Pa Gomez was part of the legal team that defended late Chief Obafemi Awolowo during his celebrated treason trial in 1962. He is also reputed as the first lawyer to sue the Military Government in Nigeria in the celebrated case of Madam Shapara vs. Lagos State Government. An avid yoga practitioner, Pa Gomez is a longstanding advocate for the welfare especially of young lawyers. He is the author of two books, including “Guide to Happy Marriage.” He was married with children.